In “The Story of Kari – Part I” I went back to the very roots of my hobby history, told you about the first contact of mine to the Citadel miniatures and how things started for me. In this part I will let you know how I got back to the hobby and how I grew up as a hobbyist and evolved as an artist. Stepping in the small hobby shop in Seinäjoki and participating in the playful little painting competition back in the 2005 meant a restart for my miniature hobby, bringing the long smoldering hobby spirit back to life. I was glad to find the long lost friend again and felt like it was a starting point of a new era for me and my artistic side of life. It was, with dramatic consequences I nor nobody else could have predict. I once again saw myself buying a set of paints, brushes and some miniatures to paint, like the keen little Kari back in the early 90’s. I practiced assembling and painting miniatures with some old plastic Squats I had found back at my parents house. I was pretty pleased by the end results back then, although looking at them now I must say they were less of a success (and thus I won’t be publishing them anywhere!). It wasn’t easy in the beginning, that I can tell you. After all, I had to learn all the tricks all over again since it had been over a decade the last time I had painted eyes and pupils to the little men. But I didn’t give up and just kept pushing forward. The thing is, when someone really decides to do something, that someone should do it with positive attitude and healthy self-confidence, which helps to keep things in motion. I think the attitude and the self-confidence are two of the most important factors in the learning process of miniature painting. Right attitude means you don’t give up even though you don’t success at the first go. With right attitude you know your position but also know that giving your best every time and learning from the mistakes you do eventually help to elevate you to the level you aim at. With right-minded self-confidence you are able to put your work in the right measure and inspect it with healthy criticism. You trust yourself and know that even though this miniature isn’t ‘Eavy Metal standard right now, you’ve been able to learn new tricks during the process of doing it, acknowledge the mistakes you’ve done and know that you are on the right road to accomplish whatever thing you are after. Anyway, the hunger grew as I moved from one project to another. I got better painter, more creative and I had formed a strong base for an idea of what I wanted from my hobby. I started collecting old miniatures, the classic range, building armies I used to paint and play with when I was a young teenager. I had strong vision based on nostalgia and memories and wanted to use my new skills to bring life to the old lead the way I wish I would have been able to do when I was just a kid. 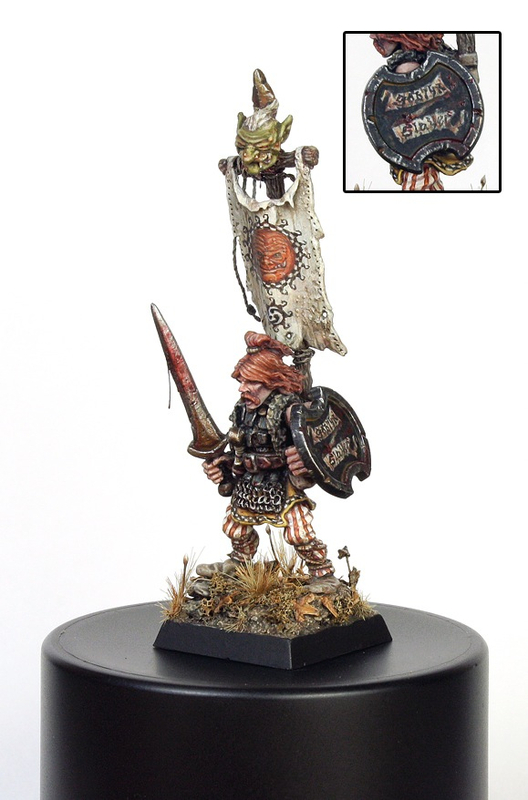 I started many armies – Dwarfs, Elves, Chaos, Orcs and so on, but unfortunately finished non of them. My plans were ambitious, maybe even too grand, yet I kept painting and collecting miniatures, thinking “maybe some day” in my mind. The Oldhammer period lasted for nearly half a decade, during which I met Mikko. Together we established our infamous blog Spiky Rat Pack, which pushed our visions forward, kept us inspired and helped us to exceed our limits again and again. The blog also helped us to network with many great hobbyists around the World, even with some unexpected heroes of our times. In 2011 I traveled to Nottingham together with Mikko to take part in Golden Demon. I got my entry – the Goblyn Slayer – to finals, but was left without a Demon. I think the entry was way too off from the main stream and had no strong narrative point, therefor no chance of ranking. That didn’t really matter at all, as I had a chance to meet and greet the artist whose art has had a great influence in me – John Blanche. Meeting John meant a lot to me. Seeing his art up close and live during the bus trip from Nottingham to Birmingham was one thing of course, but actually having a chat with him during the Games Day and later in front of pints was literally mind opening experience. It was a chance to talk about hobby and art in general with the man whose work had been guiding my visual intuition for so long. That meeting opened my eyes. It was a beginning of a new era for me, not only in my hobby but also the way I started perceive creativity in general – a rebirth. The Goblyn Slayer, my entry to Golden Demon 2011. I wanted to paint a classic Jes Goodwin’s miniature with iconic elements inspired by John Blanche’s art work. 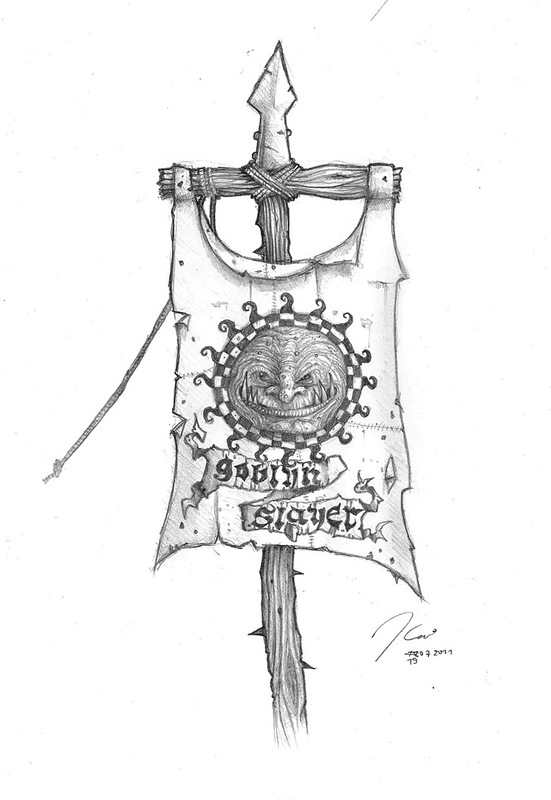 A sketch for the Goblyn Slayer’s banner. Obvious references to classic Blanche’s art. I put the old lead aside (though I still have a soft spot for it) and focused completely on 40k, namely on the odd veins of the universe like INQ28, Confrontation and the similar cases. I forged, shaped and polished the vision of the dystopian future of the mankind from my mind to flesh, with pictures, short stories and miniature designs. If you ask me, the universe of 40k is grim as hell, graphic and murderous place to live and survive. It’s a realm of fear, Lovecraftian some could say. Even beautiful is bias, just “less ugly” or grotesque – a slice from Name of the Rose if you know what I mean. This was the theme in which I started wrapping my miniatures in. I was able to lure Mikko in to making an INQ28 gang too, so that we could some day play a game of INQ28 together. This plan evolved in to a campaign known as the Punk Moth, an act where two Inquisitors, Marius Cassar and Pherion of Mars would be playing leading roles. Later both of the gangs made their presence in White Dwarf’s Blanchitsu, which was a great honor and a dream come true for both of us. The campaign itself is still to be played, but that’s another story. Inquisitor Marius Cassar and his retinue, the Rogues Malus. 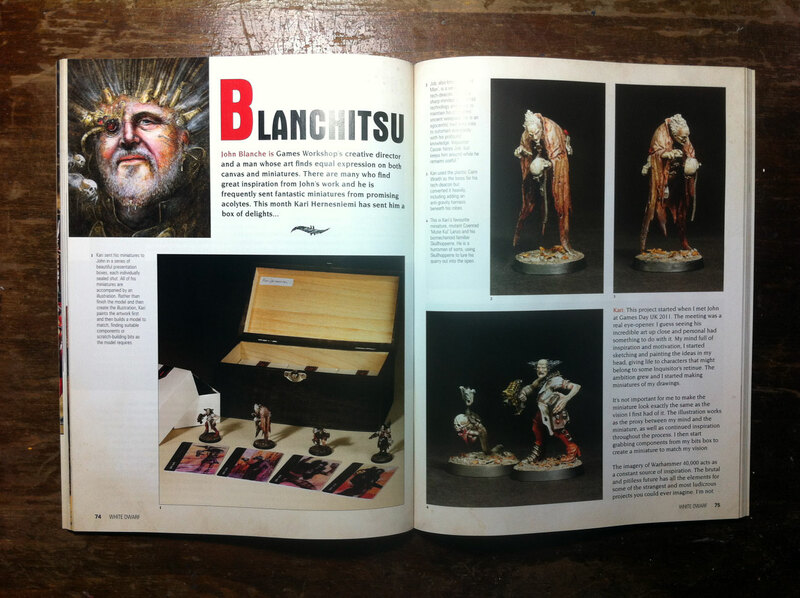 Cassar and some members of his crew freatured in White Dwarf (March 2013) – Blanchitsu. It truly was a golden age of the hobby and 40k. I started new projects, my own and some commissions. If I had to bring some of them in light, I would have to name the Red Corsairs – an art-scale renegade astartes project that has evolved from a single miniature experiment to something way more interesting – and the Arco Evisorators – deadly servants of Mechanicus with chainswords as their murderous weapons bound to their flesh. The latter were done as a commission to John Blanche and eventually made an appearance in new Warhammer Vision #12 Blanchitsu next to John’s own Adeptus Mechanicus. 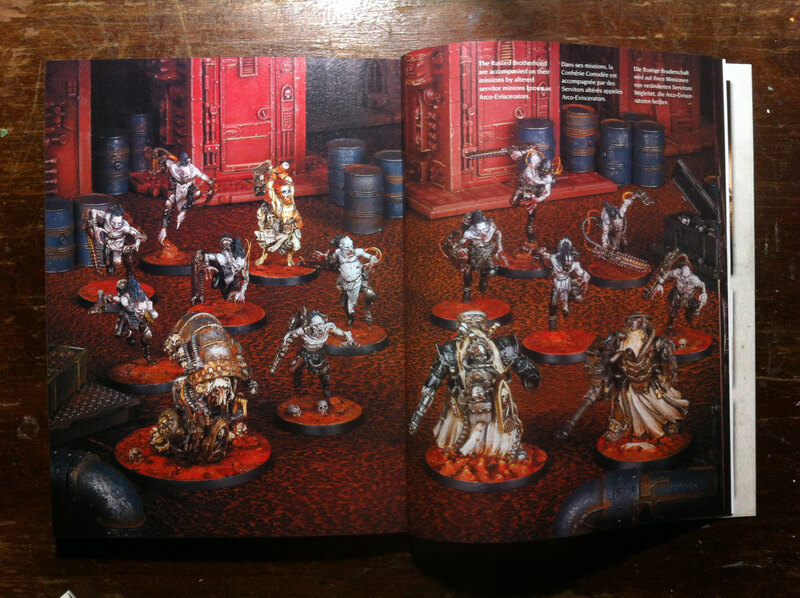 Arco Evisorators next to John Blanche’s Adeptus Mechanicus personalities, in Warhammer Visions #12 – Blanchitsu. Meanwhile the Spiky Rat Pack as a blog was getting less and less attention, thanks to whatever excuse we could come up with. As a result it started withering, fading away. It was a pity as we both, I and Mikko, really liked blogging and opening our minds to the rest of the community, but lacked inspiration and motion. Then came the birth of the Iron Sleet. If I recall it correctly, it was Migs of Legion of Plastic who first suggested in a private converstion that we should have a united channel to share our creative work. It felt quite natural step for us Rats to take, since our visions of the 40k universe, visual styles and the things that we appreciate in the hobby are very similar to Migs’. I also looked very much forward to working next to Migs, whose amazing miniature projects and intriguing artistic endeavors I have been following many years with great interest. So we took the leap without hesitation. Thank you for reading this long introduction of mine, my fellow hobbyists. This is a beginning of a great journey, which I promise you’ll most definitely enjoy following. …and thank you for sharing this great read Kari! 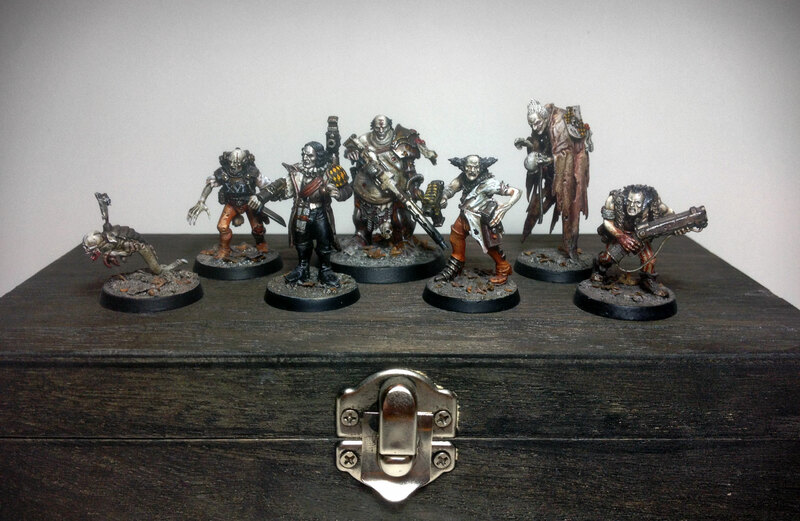 Spiky Rat Pack was one of those blogs out of a very few that rekindled my own passion for the weathered worlds of Warhammer – and Iron Sleet is just pure fuel to that fire. I look very much forward to follow your progress towards 2018(ish) and the quest for that coveted Demon. So much of this mirrors my own experience with entering, leaving, and rediscovering the hobby – and a big thanks goes to you all here as well as Spiky Rat Pack, Legion of Plastic, and then Iron Sleet not only inspired me to come back to the hobby, but gave me focus with the rediscovery of the Inq28/munda/Confrontation community. Of course a huge part of that as well is John Blanche, and my love of his work for the past 26 years when I first started playing the GW games. Beautiful way makes of work and also pleasure, a beautiful example! Of what to motivate us for another 40 000 years! Many thanks for your kind words, François. I’m quite sad about the Spikyratpack but it is great to see that the adventure now continues here! Thanks MarK! You’re so right. Even though the level of the painting is nowadays freaking great, there’s still very much room for all sorts of experimental techniques and styles. I used to love the CMON “top ten” painting style, but the appreciation has since gradually evolved in more expressional approaches. The Goblyn Slayer was my final old school miniature that I made, kind of a closure for an era. I still dream of getting back to the “old lead”, since I have pretty good stack of them oldhammer figures in boxes. Kari, what do you say we go to golden demon this year? As you said, “get it out of our system” as soon as possible. I’m coming to Finland for summer and I bet we could undertake a worthy plan. Hmm, that sounds really tempting. This year’s Golden Demon might come a bit too early, but I’m sure we might at least have a meeting in Helsinki at some point in the Summer. That would be awesome! wow, your story is inspiring to all ‘laspsed’ gamers/modellers, and to get to sit and talk, with the LEGEND that is JB…..
What an honour it is to have your figures lovingly nestled in with his own warband, I have all the issues of Visions, and I have to say that section is why I buy the magazine, and I loved that issues warband. The goblin slayer is still one my personal favourites from you, Kari. It´s got such a wonderful oldschool vibe. Great stuff! I very much enjoyed part 1 and 2. Your work is inspiring and makes me push boundaries. Keep up the amazing work.